Known as the City of the Coal, Datong has developed into the second largest industrial city in Shanxi due to its advantage in energy. Its large reserves of coal make it a very important energy base for China. Since it is a key resource city, transportation connections with Datong are quite convenient, especially by road and by train. Series of railways and roads work as a huge net to connect Datong with many other cities. Datong is one of the 24 famous historical and cultural cities in China due to its ever prosperous history. With a history of over 2400 years, Datong was the capital of Northern Wei (386-534) for 96 years, and the support capital of Liao (916-1125) and Jin (1115-1234). It was the political, economic and military center of ancient North China, which attracted many people from various nations for trade or business. These prosperous days left Datong with a series of splendid historic and cultural relics like the Yungang Grottoes and Hanging Monastery. Most of them are the integration of minorities cultural and Han culture. As one of the twenty-four famous historical cities in China, Datong is known for its abundant historical relics and natural beauty. Unlike the pretty and elegant scene in cities south of China, sceneries in Datong boast the air of majesty and grandeur. Datong was originally the capital of Northern Wei (386-534) and the support capital of Liao (916-1125) and Jin (1115-1234). Northern Wei is a stage during which Buddhism developed quite rapidly in China. In the later Liao and Jin, the belief in Buddhism also increased to a high level. Therefore, as the countrys political and economic center, many temples, pagodas and other b uildings related to Buddhism were set up during these periods in Datong. 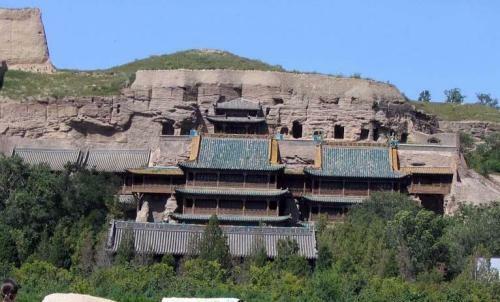 The Huayan Monastery in Daxi Street of Datong City established in Liao is typical. The statues, frescos and some of the buildings in Huayan Temple betray the typical artistic and architecture style of the Liao Dynasty. Inside the south gate of Datong City, the Shanhua Temple is a majestic well-preserved building group of Liao and Jin which is famous for the well-spaced layout as well as the vivid statues of Buddhas and Buddhism frescos. 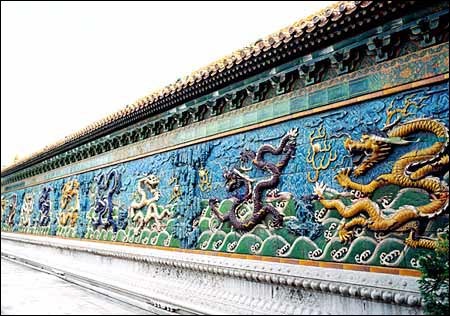 Moreover, the Nine-dragon Screen in the East Street of Datong City is also worth a visit. It is the largest and earliest one of the three famous Nine-dragon Screens in China. The most majestic spot in Datong must be the Yungang Grottoes situated 16 kilometers (9.9 miles) to the west of the city center of Datong. According to the record, the construction of these grottoes lasted 50 years, and more than 40 thousand people took part in the project. There are now 53 grottoes with 51000 statues remaining. It is one of the largest grotto-groups in China. The grand natural sceneries of Datong can be found in Mt. Hengshan. 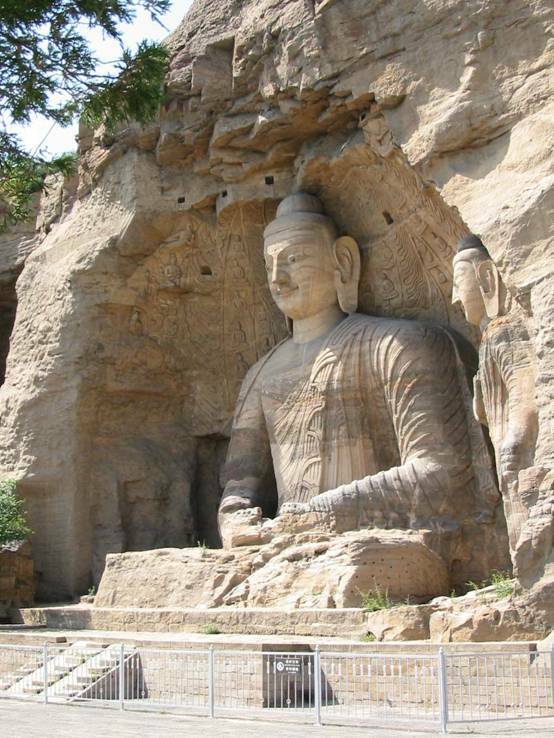 It is located in the Hunyuan County about 60 kilometers (37.3 miles) to the south east of the urban area of Datong. As one of the Five Sacred Mountains in China, Mt. Hengshan is a great attraction to people all over China for its charming natural beauty as well as its intriguing manmade miracles. The peculiar wood-structured Hanging Monastery on the cliff at the foot of Mt. Hengshan gives a breath-taking view of Chinese architecture. Yanmenguan Pass within the Hengshan Mountain range is one of the three important passes through the inner line of the Great Wall in Shanxi section. Because of the numerous pagodas in Datong it has been known as the City of Pagodas. Though there are only six left today, each of them is elaborate, especially the Wooden Pagoda in Ying County. This pagoda is over 900 years old and is attractive for its exquisite design and delicate appearance. Datong is located in the north of Shanxi Province, bordering Inner Mongolia in the north and Shaanxi in the west. The local cuisine was inevitably influenced by agricultural and nomadic cultures. Similar to other places in Shanxi Province, the wheaten food is the staple food for local people in Datong. Dozens of different types of Noodles, steamed bread and dumplings are popular in the area. A piece of dough can be made into hundreds of different food. Apart from wheaten food, the people like to eat the food served with mature vinegar. They believe it is very healthy to the body. 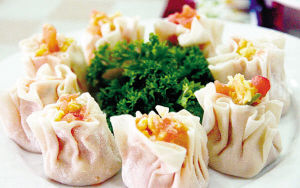 The famous local delicacies include quick-sliced noodle, pea noodle, deep-fried cake, flower Shao-mai (steamed dumplings stuffed with meat) and oat flour noodle. As its name implies, egg carving means carving on the thin and fragile egg. The similar handicrafts may be common seen in western countries during the Easter Day. However, Datong egg carving is much different from those in western country for its Chinese style content. Things on Chinese art like Chinese Calligraphy, Facial Painting and Chinese Painting are carved on the egg shells. With well design on the composition and delicate result of carving, the Datong egg carving boasts pretty high artistic value. A silk doll is a kind of traditional Chinese handicraft with a history of over one thousand years. Most figures of the dolls come from the traditional Chinese stories, like beauties in A Dream of Red Mansions (one of the four famous classical literature works in China) and the figure in the frescos of Yungang Grottoes. Bone of the doll is made of thin wire; muscle is made of cotton. With fine silks made skin and clothes, the doll boasts quite comfortable feel. And each one has vivid expression. With a history of over 1400 years, the process of porcelain production in Datong is well developed. Using a unique method of production, porcelain figurines can be fashioned into many shapes such as animals and figures from traditional Chinese stories. Highly breathable, smooth, soft to the touch and very pliable, processed corn husk can be used to create many useful articles such as coasters, cushions and mats. Daxi Street and Xiaonan Street are two commercial areas in Datong City where most shoppers will delight in finding most of the department stores and shops selling clothing and jewelry.